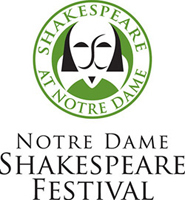 The Notre Dame Shakespeare Festival (NDSF) has announced the titles and audition dates for its upcoming 2016 summer season. In order to explore and celebrate Shakespeare’s final plays, NDSF has selected two works that embody the playwright’s voice at the close of his career. The 2016 season is named “Shakespeare’s Last Words” and will feature adventure, exhilaration, and redemption. The 2016 Professional Company production will be The Tempest. Set during the golden age of sea exploration, The Tempest investigates human freedom: our desire to achieve it, our struggle to preserve it, and our forgiveness of those who have taken it away. The play’s enchanted island setting will be enhanced by modern circus arts including aerial acrobatics and wind illusions. Featuring professional actors and designers from around the world, The Tempest is directed by West Hyler, currently working on Cirque du Soleil’s first-ever production on Broadway. The Tempest will be performed August 16-28, 2016, in the DeBartolo Performing Arts Center’s Patricia George Decio Theatre. The 2016 Young Company, NDSF’s free Shakespeare-in-the-park touring show, will present Pericles, Prince of Tyre, an epic high-seas adventure laden with shipwrecks, magic, and music. Featuring college and university students from Notre Dame, Saint Mary’s, and across the nation, this year’s Young Company production will be directed by award-winning Brooklyn-based theatre director Pirronne Yousefzadeh. Pericles, Prince of Tyre will be performed in outdoor locations across northern Indiana and southwest Michigan, from July 17 through August 22, 2016. The Notre Dame Shakespeare Festival will hold open auditions on Saturday, December 5, from 10 a.m. ­to 6 p.m. The festival is seeking community and professional actors for The Tempest and undergraduate and graduate students for the Young Company. Young Company actors will be cast in both productions. Actors should prepare one classical monologue under two minutes in length. For more information and to schedule an audition time, actors may contact NDSFAuditions@nd.edu. Originally published by Aaron Nichols at al.nd.edu on November 11, 2015.